Pull steadily without twisting until you can ease the tick head straight out of the skin. 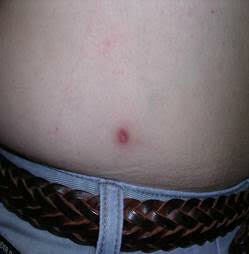 DO NOT apply substances such as petroleum jelly, nail polish, or a lighted match to the tick while it is attached. 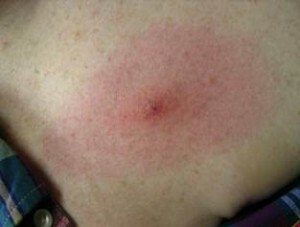 They may agitate the tick and force more infected fluid into the skin. Once you have removed the tick, wash the wound site and your hands with soap and water, and apply rubbing alcohol or antiseptic to the site. Observe the bite site over the next two weeks for any signs of an expanding red rash or flu-like symptoms. Consult with your PCP about sending your tick to a lab to be tested for pathogens. Lyme disease is a clinical diagnosis made by a doctor or nurse by examining the patient. Acute Lyme disease is not a laboratory diagnosis; a negative Lyme blood test does not exclude Lyme disease in the first few weeks of the illness. Many with Lyme disease have a flu-like illness and NO rash. Fever, aches, and abrupt and severe fatigue can be the main symptoms of acute Lyme. Lyme disease is different from a respiratory “cold”. A runny nose and prominent cough are NOT symptoms of Lyme disease. Blood tests do not accurately diagnose Lyme disease in the first few weeks of infection, so being vigilant about looking for symptoms is a more reliable way to identify an early case of Lyme disease. If you have a tick bite, watch for an expanding red rash or lesion at the site of the tick bite or an unexplained feverish, achy, fatiguing illness within 1 to 4 weeks after the tick bite. If you are concerned about symptoms or a rash, take a picture of the rash and contact your physician.